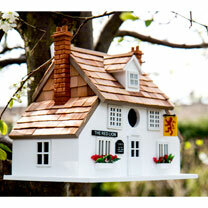 A highly decorative and functional birdhouse. Ideal for birds and a great feature for your garden. 25 x 28.5 x 18.5cm. Beautifully detailed and inspired by real buildings from around the world, these fully functional birdhouses will make an unusual statement feature in your garden. They can also be enjoyed in the home as a decorative accessory! Handcrafted from exterior grade ply-board, kiln-dried hardwood and western red cedar shingles for the roofs.